Are you disorganized, chronically late, forgetful, or impulsive? Do you struggle to get your homework done, but never manage to turn it in on time? It may not be your fault. You might have executive functioning disorder (EFD), an attention disorder marked by an inability to stay on task that is common in people with learning disabilities. If you have tried to better manage your time and meet deadlines with little success, you may feel like giving up. 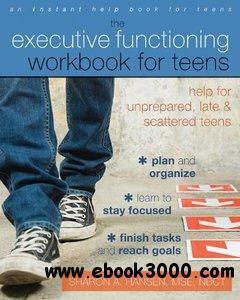 The Executive Functioning Workbook for Teens is an easy-to-use, practical workbook written by a licensed school counselor, and it will provide you with the skills needed to get organized, retain information, communicate effectively, and perform well in school and everyday life. Based in proven-effective cognitive behavioral therapy (CBT), the book offers activities that will help you better understand your disorder and cope with it effectively. With one chapter for each of the ten main areas of EFD, the book also includes tips for initiating positive action and change, improving flexibility in thinking, sustaining attention, organizing, planning, enhancing memory, managing emotions, and building self-awareness. Written in a fun, engaging format, this book is designed to motivate and inspire you to carry out and complete tasks with ease. From handling frustration to taking notes in class, this book will help you hone the skills you need to succeed.